Guitarist Craig Ogden is the President of Leeds Symphony Orchestra. Craig was born in Perth, Western Australia, and began studying the guitar at the age of seven. He completed his music degree with honours at the University of Western Australia before moving to the United Kingdom in 1990. Craig undertook two years of performance study at the Royal Northern College of Music in Manchester from which he graduated in 1992 with the highest award possible for performance, the Professional Performance Diploma with distinction. 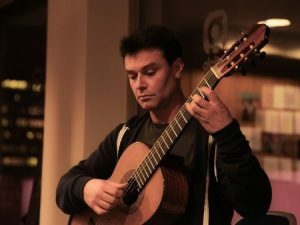 He is Principal Lecturer in Guitar at the Royal Northern College of Music in Manchester and Visiting Lecturer at London’s Royal College of Music. In the United Kingdom, Craig has performed concertos with all the major orchestras. He has recorded CDs for Classic FM, Sony, Virgin / EMI, Hyperion, Nimbus and Chandos. In 1998, he recorded the soundtrack to the film Notting Hill. In April 2005, Craig made his American debut at the Lincoln Centre in New York. Craig has performed regularly all over Europe and last year visited Hong Kong and Shanghai. His performances are broadcasted regularly on BBC Radio 3 and Classic FM. Craig regularly appears as soloist and chamber musician at the major London venues and collaborates regularly with many of the UK’s top artists and ensembles. 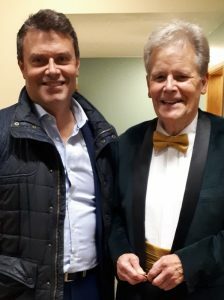 In 2008 he made his presenting debut on BBC Radio 3 in The Segovia Legacy and in 2011 presented a series of interviews with artists including John Williams for ABC Classic FM (Australia). Craig also appears in recitals with his wife, the mezzo-soprano Claire Bradshaw. Claire has also appeared with Leeds Symphony Orchestra in performances of Elgar’s Sea Pictures, Berlioz’ Les nuits d’ét, Mahler’s Lieder eines fahrenden Gesellen and operatic arias by Mozart. In 2000, Leeds Symphony Orchestra commissioned Arthur Butterworth to compose a Guitar Concerto. This was given its first performances, to much popular and critical acclaim, by Craig and the Orchestra, conducted by Martin, in November of that year. A second guitar concerto, Black Island by Richard Herriott was commissioned in 2005 by Leeds Symphony Orchestra and premièred in November 2006, again with Martin conducting. With Leeds Symphony Orchestra, Craig has also performed both Rodrigo’s Concierto de Aranjuez and the Fantasia para un gentilhombre and the guitar concertos of Castelnuovo-Tedesco, Malcolm Arnold, Villa Lobos, and Manuel Ponce, a total of eight concertos in all, in over 30 appearances with the orchestra since 1994.